NASA Goddard Space Flight Center and NASA Jet Propulsion Laboratory have put out press releases about observations of WASP-18b with the Hubble Space Telescope and the Spitzer Space Telescope. The main finding is that WASP-18b, a highly irradiated hot Jupiter in a tight orbit around a hot F-type star, is “wrapped in a smothering stratosphere loaded with carbon monoxide and devoid of water”. This entry was posted in exoplanet atmospheres, Hot Jupiters, Hubble Space Telescope, WASP planets and tagged Spitzer, WASP-18b on December 1, 2017 by waspplanets. The James Webb Space Telescope is expected to revolutionise the study of exoplanet atmospheres following its launch in 2018, and WASP planets will be among the prime targets. 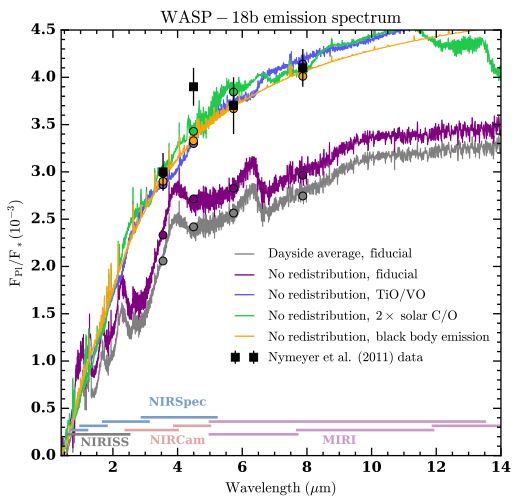 Paul Mollière et al have been simulating the data expected, and have produced this illustration of the atmospheric emission spectrum of WASP-18b. 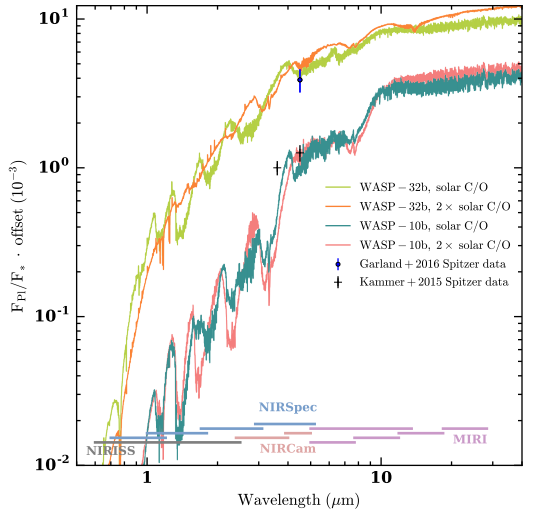 The different coloured curves result from different assumptions about WASP-18b’s atmosphere. The lines along the bottom illustrate the spectral coverage of the different JWST instruments. In contrast to existing data (Spitzer results are shown as black squares), the JWST data will have both the spectral resolution and signal-to-noise to differentiate clearly between different models. Mollière et al have also simulated spectra for cooler planets, such as WASP-10b and WASP-32b. The different models are for different abundances of carbon relative to oxygen (C/O), showing that JWST should be able to settle the issue of which exoplanets have enhanced abundances of carbon relative to the Solar System. Such simulations show that the results from JWST should be spectacular, opening up whole new areas of enquiry. This entry was posted in exoplanet atmospheres, Hot Jupiters, WASP planets and tagged JWST, WASP-10b, WASP-18b, WASP-32b on December 1, 2016 by waspplanets. If a hot Jupiter has a magnetic field of a few Gauss it would be surrounded by a magnetosphere that would carve out a hole in the stellar wind of the host star. Since the planet orbits rapidly, this would lead to a “bow shock” where the magnetosphere ploughs through the stellar wind. 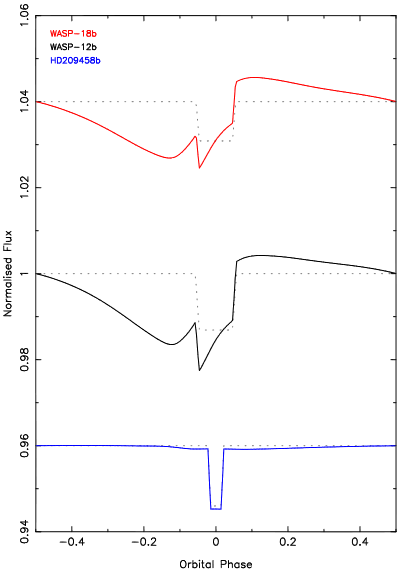 In a new paper, Richard Alexander, of the University of Leicester, and co-authors, report computer simulations of this effect for several hot Jupiters, including WASP-12b and WASP-18b. In the colour-coded figure (see scale on the right) the blue and red show the density of the stellar wind. A low-density (black) magnetosphere surrounds each planet (white dots). Since these planets orbit edge on to us, the bow shock would absorb ultra-violet light from the star, and so produce a characteristic light-curve with a broad dip preceding the transit. This magnetospheric bow-shock is a possible alternative explanation for the UV absorption observed in WASP-12, which has previously been attributed to material being lost from the planet owing to Roche-lobe overflow. Alexander et al suggest that WASP-18 is a critical test of these models, since the much higher gravity of the massive planet WASP-18b means that there should not be any Roche-lobe overflow. This entry was posted in WASP planets and tagged Hot Jupiter, magnetic field, magnetosphere, Roche-lobe overflow, WASP-12b, WASP-18b on December 9, 2015 by waspplanets.